Wangari Muta Maathai, born in Kenya, was trained in biological sciences and received a doctorate from the University of Nairobi. Educated in veterinary medicine, she is mainly recognized for her contributions to democracy, sustainability, and women’s rights. It was through her work with the National Council of Women of Kenya that Maathai introduced the idea of planting trees with the people and developed it into a broad-based, grassroots organization. By the end of 1993, the women reported that they had planted over 20 million trees on their farms and on school and church compounds. The Green Belt Movement grew very fast. By the early 1980s, about 2,000 public green belts with about a thousand seedlings each had been established and over half a million school children were involved. Some 15,000 farmers had planted woodlots on their own farms. In 1986, the Movement established a Pan African Green Belt Network and has introduced over 40 individuals from other African countries to its approach. This has led to the adoption of Green Belt methods in Tanzania, Uganda, Malawi, Lesotho, Ethiopia, Zimbabwe and some other countries of the region. The overall aim of the Movement has been to create public awareness of the need to protect the environment through sustainable management. More specifically, it has initiatives to promotes bio-diversity, to protect soil, to create jobs, and to support women in the community and in leadership. It has made tree planting an income-generating activity, promotes food security, and helps people to make the link between environmental degradation and many of the problems they face, including poverty and livelihood insecurity. Since the Movement began, environmental awareness has been greatly increased in the country, and many women's groups have sold millions of seedlings to the Movement, using the income to meet immediate domestic needs such as education of their children or investing it in other income-generating ventures. Tree planting has become an honorable activity and many people have adopted it. Relevant knowledge and techniques have been imparted to the participants and many women have become 'foresters without diplomas'. There are now over 3,000 tree nurseries and more than 3,000 part-time jobs have been created. In later years, Wangari Maathai's own work focused on the human rights situation in Kenya. Standing up for a democratic, multi-ethnic Kenya, she was subjected to defamation, persecution, detention and physical attacks. 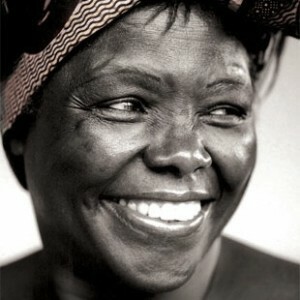 Wangari Maathai received numerous awards and honorary degrees. In 2004, she was awarded the Nobel Peace Prize. Time Magazine identified her as one of 100 most influential people in the world in 2005, and the Forbes Magazine listed her as one of 100 most powerful women in the world. She was awarded the Nelson Mandela Award for Health and Human Rights in 2007 and the Lions Humanitarian Award and the International Freedom Award in 2010.